One-dimensional (1D) electronic systems are currently intensively investigated for both fundamental and technological reasons. Highly anisotropic surface superstructures have attracted considerable attention in this context. An acutely studied model system of this kind is the ordered atomic-scale array of self-assembled In nanowires that forms the Si(111)-(4x1)In phase at room temperature. More than 10 years ago it was discovered that this nanowire array undergoes a reversible metal-insulator transition from (4x1) to (8x2) translational symmetry at T=120K. Despite intensive discussion in the scientific literature, both the phase transition's driving mechanism and low temperature ground-state with its associated properties remain strongly controversial. 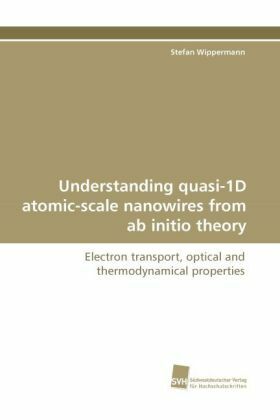 In the present work the In/Si(111)-(4x1)/(8x2) nanowire array is investigated by means of state-of-the-art ab initio computer simulations, revealing for the first time the origin and nature of the phase transition. The results demonstrate the enormous importance of entropy contributions to the stability of low-dimensional systems and provide an important addition to the 1930s' Peierls theorem.